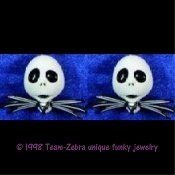 JACK SKELLINGTON DANGLE EARRINGS - Nightmare Before Christmas - Gothic Punk Jewelry - E - Halloween Pirate Charm, Headhunter Witch Doctor Skulls. Rubbery Plastic, Dimensional Charm, approx. 1-inch.